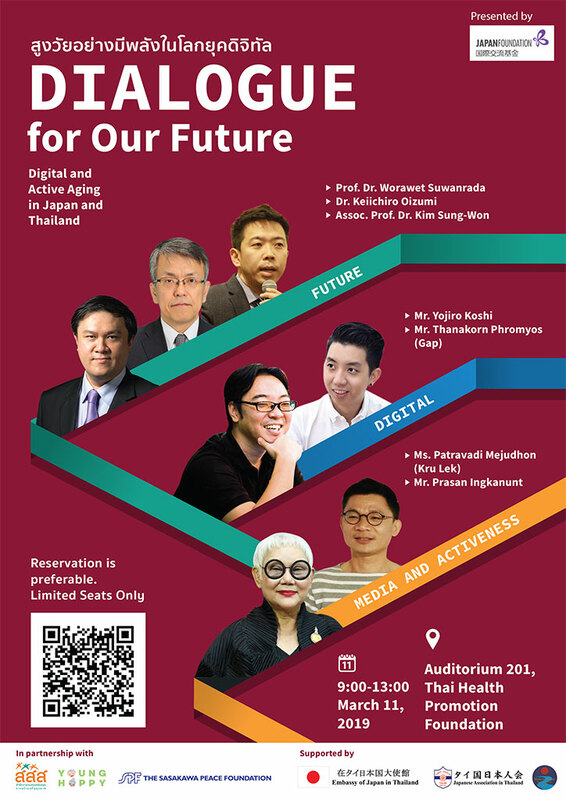 The Japan Foundation Bangkok, in collaboration with Thai Health Promotion Foundation, the Embassy of Japan in Thailand, Japanese Association in Thailand and Sasakawa Peace Foundation are co-organizing the public seminar entitled “Digital and Active Aging in Japan and Thailand” on March 11th (Mon. ), 2019 at the Auditorium 201 of Thai Health Promotion Foundation from 9:00 – 13:00 hrs. Currently, a severely ageing population has become one of the most significant common issues in both Thailand and Japan. The purpose of this seminar is to take this issue as an opportunity to think for a solution for our better future by means of dialogues not only in two countries but also including another country, South Korea. The Thai population is aging rapidly which is said to be faster than Japan. This half-day public seminar is organized with aiming at an appropriate solution to create the content about sharing the latest knowledge and cases from Japan and making clear strong and weak points in Thailand. The question such as what our future will be like and what extent our country and people can understand and manage this issue could be interesting for general Thai people. For instance, the case of young Thai and Japanese entrepreneurs create a new solution and platform of human resource development as well as bridging the digital divide among elderly and young people would be very much attentive, as well as the role of media and active artist who tremendously contribute significantly to the better understanding of Thai ageing societies and the advancement of Thai arts and cultural scenes will be very much attractively elaborated. For those who are interested in attending into this event, please kindly reserve the seats well in advance at following notice. 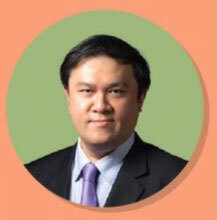 Managing Director, Boon Me Rit Co., Ltd. 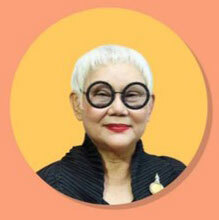 The founder and artistic director of Patravadi Theatre in Bangkok, is an award-winning actress, playwright-director-producer, well-respected mentor, and an advocate for cultural policy in Thailand. Trained in Thai classical dance and singing since she was a child, Ms. Patravadi, who is widely called “Kru Lek”, furthered her training in western style theatre and dance with various schools and masters in England, New York, and Canada. Ms. Patravadi experiments the fusion of traditional Thai elements with contemporary theatre presentation techniques to create her signature style of contemporary Thai theatre. She also uses theatre to promote the understanding of Buddhist philosophy, and she founded the Dhamma Theatre Foundation under the patronage of His Holiness The Supreme Patriarch. Her dedication and commitment to the development of Thai performing arts has won her the prestigious “Golden Sithi Tada Award” from HRH Princess Sirindhorn, the Thai National Artist awards in 2014 as well as the French Chevalier. Her works have been invited to represent Thailand in many international occurrences. Her latest project, Vic Hua Hin, is a large scale comprehensive art complex that houses Patravadi School Hua Hin, a school that teaches normal curriculum with a creative approach. Graduated B.A. from Faculty of Liberal Arts, Thammasat University and M.A. 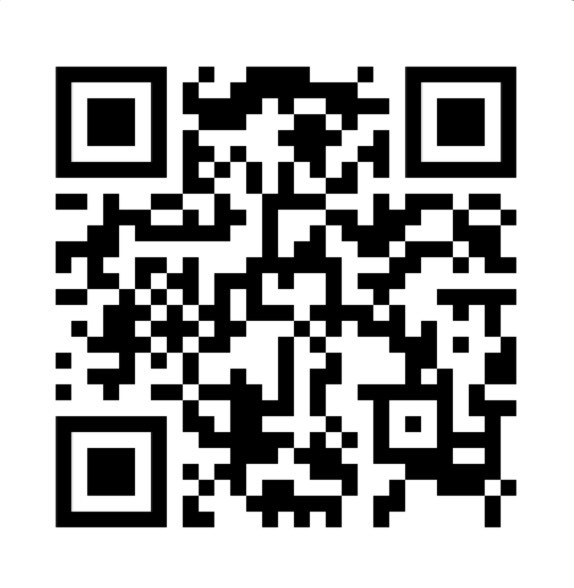 in Interactive Multimedia from the London Institute (London College of Printing), England. He was the former TV human documentary and famous producer of its TV Program “Khon Kon Khuon” by TV Burapha Co., Ltd. 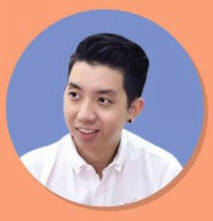 Currently, he run his own TV production company called “Boon Me Rit”, which produces a lot of documentary and feature stories about Thai social issues including environmental, health and ageing issues, which one of his most successful TV program promoting for the active ageing and elderly people have been broadcasted in Thai PBS since 2017. 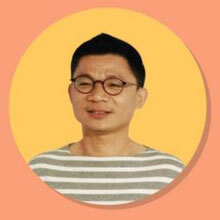 Co-founder of “Young Happy”, a Social Enterprise that promoting digital divide for elderly people by creating mobile applications to connect elderly people with rapid changing of new information technology for their health and happiness. 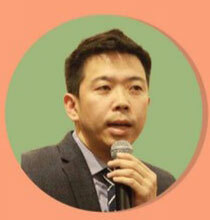 He is a Senior Economist of Economics Department, The Japan Research Institute, Limited, who is also a lecturer and award-winning author. He began his career as an economist at the Sakura Research Institute, Limited (now the research division has been consolidated to the Japan Research Institute, Limited) in 1990. His areas of expertise include demographic change and economic growth in Asia, and socioeconomic issues surrounding the urbanization of Asia. 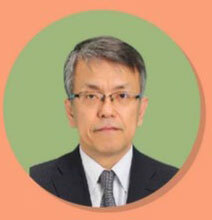 Dr. Oizumi particularly focuses his research on economies of ASEAN countries. In 2007 he published a book, ‘The Ageing Asia’ (老いてゆくアジア) and won the Award for the Promotion of Studies on Developing Countries, the award bestowed by IDE-JETRO, Institute of Developing Countries Japan External Trade Organization for outstanding publications on economic and other issues concerning developing countries. As one of the leading experts on Asian economies, he is also a director of Japan Association for Asian Studies and the Japanese Society for Thai Studies. Oizumi received his Master’s degree in Agricultural Science and Ph.D. degree in Area Studies from Kyoto University. Graduated from University of Tokyo with B.A. in Social Psychology. 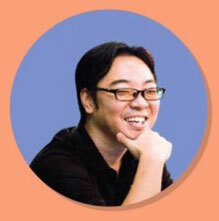 Mr. Koshi is the founder and CEO of TalentEx. He was previously working with Japanese mobile advertising network company called “Nobot” (acquired by Japanese telecommunication KDDI’s subsidiary of “Mediba” back in 2011) for their business developments in Thailand. He figured out that the new wave of innovation has not yet reached the Thai recruiting industry, and is trying to bring never-before-seen services to this space. Then, he resigned from the job in March 2013. Founded TalentEx in Nov 2013, which is engaged in an innovation of a human resources market in the Southeast Asia. Born in Seoul, South Korea. After earning a degree in social welfare at Yonsei University, completed his master’s and doctorate in sociology at the University of Tokyo. He has been holding the position in the University of Tokyo’s Institute of Social Science and Tokyo Keizai University’s Faculty of Economics before taking his academic position as associate professor at the Faculty of Sociology and Social Work, Meiji Gakuin University, in Japan. Currently, he moved to teach and becomes the Associate Professor at Graduate School of Humanities and Sociology, University of Tokyo with specializing in welfare sociology and comparative welfare state studies. His most recent book is Fukushi kokka no Nik-Kan hikaku: “Kōhatsukoku” ni okeru koyō hoshō, shakai hoshō (Comparing Welfare States in Japan and Korea: Employment and Social Security in “Late-Developing Nations”).